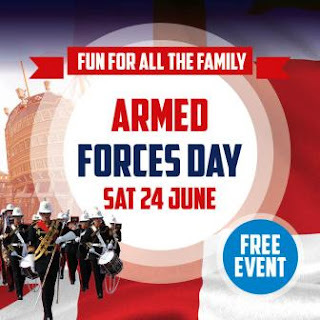 Portsmouth Historic Dockyard will be hosting an Armed Forces Day event this Saturday on 24 June 2017, welcoming veterans of all ages as well as active servicemen and women. The Royal Marines School of Music will be performing at 1300hrs and there will be a flypast by a Chinook helicopter at 1430hrs. The site will be a hive of activity with armoured fight vehicles arriving to delight visitors of all ages. The Stormer vehicle from the Local Army Reserve unit in Portsmouth as well as the 106 (Yeomanry) Regiment RA from London will offer plenty of wow moments. If visitors are feeling particularly competitive, families can visit Action Stations to take part in free activities. Adventurous visitors can try the minesweep challenge and see how many they can spot. For the traditionalist out there, the DICE group will be challenging one and all with military-inspired board games to set the mood.